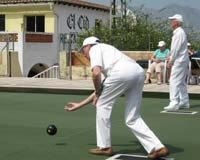 El Cid Bowling Club Edficio El Cid Ctra Benidoleig Pedreguer, Benidoleig, Alicante. 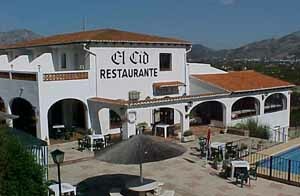 El Cid has one of the finest locations on the Northern Costa Blanca. Set among orange groves, with fantastic views of the surrounding mountains and across to the Mediterranean Sea. Edficio El Cid s/n Ctra Benidoleig – Pedreguer, 03759, Benidoleig, Alicante. Tel/fax: (+34) 96 640 4364. Contact: Bruce de Kock, Club President. Whether you are a new or experienced bowler, resident or visitor, you will get a very warm welcome at our club. 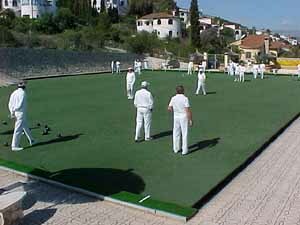 El Cid Bowling Club is located near the village of Benidoleig, about 30 mins. drive from the picturesque resort of Javea, Northern Alicante. The club is known for its high level of bowling standards. 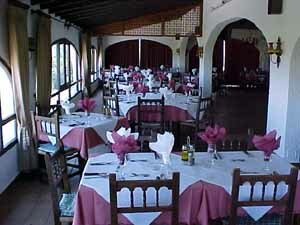 An inside view of the restaurant. Extensive terraces and pool overlook dramatic views of the mountains. Annual Club Membership – €10 per person. Apartamentos La Sella are set in a large garden complex, with an 18-hole golf course, outdoor pools and a horse-riding school. Located on the Costa Blanca 6 km from Denia, La Hacienda is surrounded by trees and gardens. 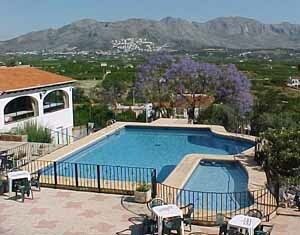 Set within a natural setting, Apartamentos La Zarzas is located in Monte La Sella, in Alicante.